Rajon Rondo vs. the Boston Celtics has heartwarming potential. Can you feel it? Can you taste it? It’s here. The most wonderful time of the year. The NBA Playoffs. Starting this weekend, a truly bonkers regular season flips into postseason mode, and all eyes will be on the marquee names — LeBron James, Kawhi Leonard, James Harden, Russell Westbrook, Stephen Curry, Kevin Durant — and their interwoven narratives of glory-hunting and anger and revenge. But if you’re poking around for something to balance off those familiar folks, may we humbly suggest an underrated little storyline? We’re talking the first-round series between the Chicago Bulls and the Boston Celtics. We’re talking the return of Rajon Rondo to Massachusetts. Rondo left Boston in 2014 as something of a star-crossed fan favorite. He’d helped lead the Celtics to the 2008 title, and was a singular player. His style was beguilingly odd, his manner aloof to the point of haughtiness. (Basically, he played like a mean cat). It can be said about very few players, but it can be said about Rondo: brother, when you were good, you were the best we had. The years since have not been kind to Rondo, though: he’s bounced around doing one-year stints in Dallas, Sacramento, and now Chicago, where he’s put up career-low numbers and been yanked in and out of the starting lineup. 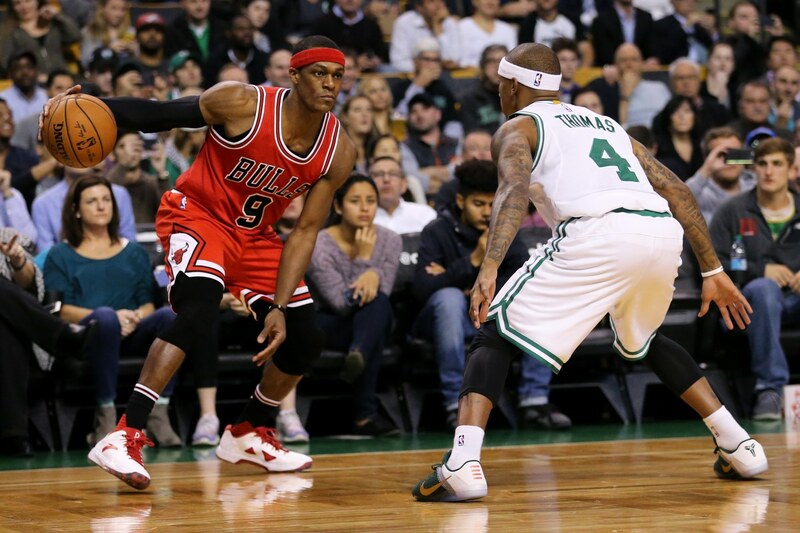 To Rondo critics, this fallow period has exposed him as the deeply flawed player he always was. The staunch Rondo supporters, however, see it differently. To the partisans he is battered and bruised, yes, but yet still capable of transcendance. Rondo has a reputation for overperforming both during nationally televised regular season games and the playoffs. It’s kind of a running joke, kind of a ding at his mercurial nature: If he tried hard all the time, maybe he’d be better?!! It’s also just plain great: when the pressure is on, this dude goes harder. In the 2011 playoffs, with Boston facing the Miami Heat and an in-form LeBron James, Rondo was taken down hard by the sneakily dirty Dwyane Wade (now his teammate in Chicago!). It was an ugly play, premeditated and dangerous, and it left Rondo’s left arm dangling lifelessly. I mean this pretty literally: that arm was, temporarily, a meat sack. So Rondo sat for a bit, and then he came back into the game, and then he played the rest of it one-handed. He poked for loose balls, dived onto the floor, whipped passes. He sprinted. He dunked. His demeanor was as stoic as ever, but there was fire in his eyes. Boston won. Clearly, this is a man capable of digging very, very deep. For Rondo, this series is not about proving the Celtics wrong for letting him go. There’s not much bad blood between him and the organization or his former teammates: says current Celtics guard Avery Bradley, who played with Rondo for several seasons, “He’s my brother … He came to my wedding and everything. That’s my brother.” Chances are high that Celtics fans will respectfully and lovingly greet their old friend Rajon. But generally, there is a play for redemption here. At 31 years of age, Rondo is considered, more or less, washed. He’s made a lot of money, made All-Star teams, won a title, will certainly continue to hold down jobs in the league for the foreseeable future. But consensus opinion is that his great years are behind him. So if there were ever a moment Rondo could show a basketball community that has largely written him off that he’s still got it, now, on national TV, is the time. Rajon: welcome back to Boston.